Hasbro continues to release Star Wars figures on a fairly regular schedule, albeit in much smaller numbers. This latest wave contains several Episode One characters in new costumes, and the one that really caught my eye was the Qui-Gon in Jedi Training Gear. 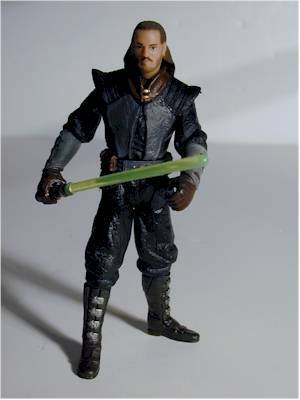 Also recently released was the Darth Maul in Sith Apprentice outfit, and this figure is very similar. Here we have a well known character wearing an outfit never seen on screen. Sometimes that works, sometimes it doesn't. If you're buying Star Wars, I recommend haunting Wal-mart. They've got these at the lower price of $5.86, beating out the rest of the bricks and mortar establishments. Nothing too new here of course, but since I've discussed this card art enough times before, I'll belittle the stupid Force File card instead. These things are pathetic, but at least Wal-mart isn't charging you a premium for them. 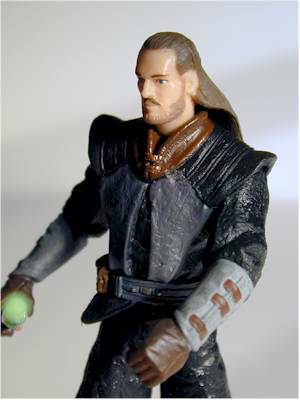 It's a decent looking Qui-gon, although it appears 'young' to me. 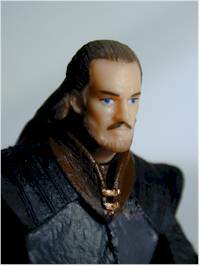 Perhaps that was the look they were going for, or perhaps they simply found it difficult to transfer the wisdom in Neeson's face in such a small medium. The sculpt on the body is the highlight here. This outfit really is eye catching, and the design would work in full scale as well. If you're looking for a unique outfit for Halloween, look no further. There's not a lot of complexity here, since the outfit is predominately a single color. But what detail there is has been done well, and overall the paint ops are pretty decent. It's amazing that Hasbro can get such well done eyes on this small of a figure, and some 1/6th scale figures come out looking cross eyed. I'm not counting that silly Force File card here - I already abused it earlier. The only real accessory is the light saber, which is nice but leaves me feeling short changed. If they hadn't done such a great job on the new design for the outfit, perhaps I wouldn't feel that way. But if they have that good of an eye, why couldn't they have been a little more creative in accessorizing this figure? Unfortunately, the cool design didn't translate into good articulation. His neck joint is worthless considering the hair sculpt, so that leaves shoulders, waist and thighs. The design of the tunic restricts the shoulders somewhat as well, and with no cut joints on the arms at the bicep or wrist, they really haven't given you much articulation you can use. Fortunately, the figure does stand well on his own, but that's about the only praise you can give him in this department. These figures are worth six bucks. They are NOT worth the seven or even eight dollars that some stores charge. Shop around if you can. Unfortunately, since the production numbers on all these figures are down (wisely), you may not get to see them more than once or twice at the store. Your options may be limited, which is why I lowered the score here. Here's a figure that has a terrific visual design, but ends up hurt by poor articulation. We know Hasbro can do better - many of their more recent figures have added articulation in the arms - but they opted out this time. 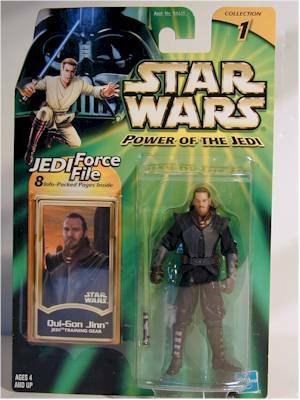 It's too bad, because this could have been my favorite Qui-Gon version. - Toy Maniacs doesn't have them in yet, and when they do you can expect to pay at least $9 plus shipping. But they should get them soon, and they are reliable. - Toyzz.com had them in, but are now sold out. They claim they'll get more next week, but again you'll be paying quite a premium at $11.99 each plus shipping.